Everybody has a business card, don’t they? And if you don’t, you should have. However virtually every business card I have seen is so boring, so ordinary, and so mundane. Why? It’s an opportunity, and it’s for people to remember you. It is the bit, that quite often when you meet people, you give them or they ask you for it. If you are going to make a difference, you are going to need to stand out. 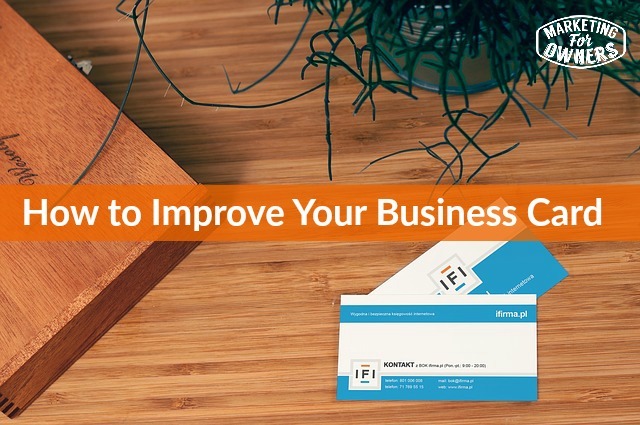 Why not make an effort with your business card? Why do you have to be the same as everyone else? Now, I am not a graphic designer and I managed to design my own and with no talent by the way. This isn’t ‘Great Jon, you are wonderful’ and I get a pat on the back. No — I am telling you if I can do it with no talent of course you can too. In fact, one of the reasons I did it was because when I went to have mine designed over the weekend, I had actually forgotten about it. I had something coming up and I had to do it quickly, so I designed them and I did them in Canva. It is free. It has lots of templates, and it is very simple to use. You can just move elements around, and upload logos and type your name and change different type faces and such. You just start messing with and trying it out playing around with the colors and everything. You can even do your little birthday invitations for your kids on there. It is super easy. Everything in it. Just go and have a go. But I did that and I was then able to use Moo. I buy business cards for myself from www.moo.com. We do use them a lot in my Fire Protection Business for business cards and such, but we also have printing done by a particular printer, who I’ve used in my businesses for the last 32 years. So to be honest, Dave is great. When you have a printer who’s been going for that long, then he’s got to be pretty good. So I use Dave at Auto Print in the UK. Hello, Dave. Thank you for everything you’ve ever done for me. So Moo is actually British. A lot of you Americans think that it’s American, but it is actually British. But they have bases in various countries. They have different cards but they have a very fast service. And I paid a little bit extra for delivery. I ordered them on Sunday and they arrived on the following Tuesday. Now that’s printed and delivered. Unbelievable. And I was actually heading for the airport and they were delivered, Tuesday morning. I was heading out off to the airport by Tuesday lunch time and they arrived before I left. But that’s not the point. It’s the business cards. Now what most people just do is they put their name, the business, possibly the logo and the address, phone number, fax number and that’s it. Seriously people, who uses faxes? And if they are, if they want a fax number, they can ring you up and ask for it. Who uses faxes? Then the email address gets added. So, there are things you are missing, and most people miss these. Social Media Buttons: This is the most basic thing. First of all, where’s your social media buttons? Not the social media buttons itself, but your social media handles. Now the only couple you probably need really are twitter and Facebook. That will do. You don’t have to list them all, because people will be able to figure it out. If you are using them all, they are bound to be on your website. Website address: So people want your website address. Now the other thing. Do they really need your address? This is a business card, this is for contacting you. If they are interested to contact you, if they need to write to you, or to send something to you, won’t they just email you? I mean, it is the 21st century. They have to email you or phone you or text you, or direct message you. People are not going to necessarily write and if they needed to write to you, they can phone you up and ask you for your address. They might then say, ‘Oh, yeah. That’s a point.’ Or if they say, ‘Oh, I’d like to.’ Say, ‘Do you want me to write it on?’ and then you can write it on the back. It doesn’t matter. If they are interested, if they are going to keep your business card, they are interested and they will ask you, for the stuff they don’t have. Logos: Use your logo and be sure to use colored business cards. Stand out. Don’t just have a white one. It costs the same to stick color on it. Use color, don’t be all yucky but use your business colors, use your company colors, again a tool like Canva or another one is PicMonkey. You can use color pickers. Just search for color picker in google and it will give you tools for free, where you can pick the color, the exact color from a logo or photo or your website and then you can copy that color and use it in Canva or whatever you are using for design. So that is that. Email address: Have the email. You don’t even necessarily need the website address. I am Jon, which is Jon if anyone’s contacting me, I am jon@fireprotectiononline.co.uk, so therefore most people can figure out that the website will be www.fireprotectiononline.co.uk. Here’s another trick by the way. When you write Fire Protection Online, don’t write fireprotectiononline. You can, but because the fire protection online is long, when it’s all written down there in lower case, which is how its normally done, it’s hard to read what it says. So put capital f for Fire, capital p for Protection, and capital o for Online and then people can read it more easily. Now it doesn’t matter if they are into Google or Gmail or Outlook or whatever. It will still work. Only with that part of it. So when you are writing your website or your email, write it like that. Tagline of What You Do: But here’s the thing, how about writing down what you do and I mean in a tagline sort of way. If you could tell somebody in 6 words what you do, what would you write there? Just see if you can sum it up. And the reason for that is because we did a lot of market research and from our customers, and we asked them what it was that they liked about us and they kept saying over and over again was that we make it easy. Where they found that fire protection was easier through us and they found it easy to buy. So we make fire safety easy. And we even registered the domain name, just in case people look for that, but if our card just says fire protection made easy, they know what we do. We don’t have to put anything else. Lead Capture on the Back: Then on the back. yes this is the other one. What have you put on the back? Have you put anything? Put a lead capture. Send them to a report, send them to a landing page, and then your business card is a lead capture as well — a list builder. And this is where people are missing out. Put it on the back. Don’t waste the back. Do not dare leave the back blank. If people have given me a card and it’s got nothing on the back, it’s the first thing I will say. And there’s another trick of mine. Moo will do one side all the same and the other side, if you have 50 done, they’ll do 50 different for no extra cost. To see what I am talking about, you will have to go to the video here. Then you’ll be able to see what I’m doing. I’ve got three business cards. They all have the same information, exactly the same. One’s orange, one’s white, one’s black. And they still use black, orange and white in some variation. On the back, they are all orange. They are all actually identical. But how about when someone comes up to you and I guarantee this will happen –people say this every single time, if someone says, ‘Have you got a card?’ I get them out and I would say, ‘What color would you like? Pick a color.’ And people talk about it. Because I tell you what, everyone picks the orange. People remember this. I also have the Moo cards. Can you see? You probably can’t see this but it has this extra line in the middle. These are double thick. The next thing is they try and pick them apart like this. They try and go like that. ‘Oh, I’ve got two stuck together.’ And I let them pick up for 5 seconds and then I say, ‘it’s not actually, it’s a special luxury card from Moo.’ They remember all that. Clever, eh? Anyway, so make the most of your things. By the way, you notice this on the back — Your Gifts. I hope that doesn’t come out back at front. And it’s got three lead captures. What a lovely thing and Fizzle is fantastic. I’d love my business to be like Fizzle’s, one day maybe. I have 2000 members, why not hear what Corbett has to say? So come back tomorrow. It will be good, in our expert interview series. I’ll speak to you soon.